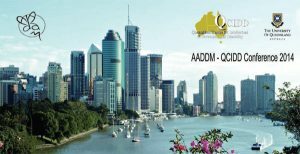 The 2014 Health and Autism Across the Lifespan Conference for the Australasian Association for Developmental Disability Medicine (AADDM) and the Queensland Centre for Intellectual and Developmental Disability (QCIDD) will be held over one day at the Mater Hospital in Brisbane on 22nd August 2014. The conference will have a very pragmatic focus for clinical practice. There will be only one stream so that delegates can enjoy the breadth of knowledge presented during the day. On Thursday 21st August 2014, we will have a pre-conference workshop and an evening Welcome Function open to all delegates.